Birregurra is a rural township near the Princes Highway between Geelong and Colac. Its precise position is on the railway line, 18 km east of Colac. It borders the western bank of the Barwon River. The Otway Ranges are immediately south and there are undulating plains to the north. In 1839 an Aboriginal mission station was established about six kilometres south of Birregurra on the Barwon River. The station ceased in 1851. One of its overseers, a Captain Bowden, had his name given to the place (Bowden’s Point) where the Cape Otway road crossed the river, and that place subsequently became Birregurra. 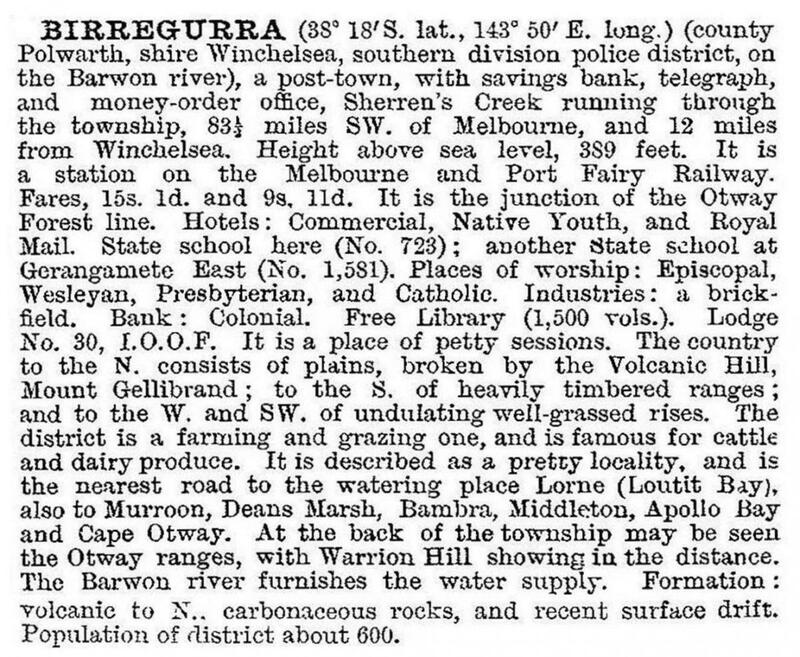 The Birregurra on Barwon township was surveyed in 1862. It is thought that the name was derived from an Aboriginal word describing ‘kangaroo camp’ or (less likely) referring to a bend in the river. The Otway Forrest railway line, branching from Birregurra was opened in 1891, looping southwards and skirting the Otway Ranges as it passed through numerous small farming settlements. Livestock and whole milk were transported, enabling a saleyards (1912) and a dairy factory (1913-55) to open in Birregurra. The town’s population approached 700 and stayed in that region until the 1960s. The Forrest railway line was closed in 1957. Birregurra has a compact shopping centre including a hotel, a general store and a restaurant. There are a community health centre in the former hospital (1944), golf and bowling clubs, a recreation reserve, an active historical society, a public hall incorporating the mechanics’ institute (1884) and Anglican, Catholic and Uniting churches. The Birregurra railway station complex (1887) is on the Victorian Heritage Register. A fortnightly journal, The Birregurra Mail, is published. In 2014 the State primary school’s enrolment was 79.